Today is the birth day of Mahatma Gandhi, if he were still walking this planet as a human he would be 140 years old. Happy Birthday dear Gandhi! On this auspicious day I have the two winners of the perfume devoted to peace samples. They are the Ace of Hearts: Charlotte Vale and the King of Clubs: Linda K. The solid natural perfume mini will be going to Linda K who specified she wanted to try a solid, while the liquid botanical perfume sample will go to Charlotte. Congratulations ladies and thank you to everyone who stopped by the journal and participated. I'm really grateful for everyone's support. 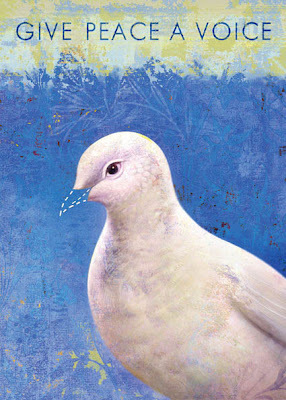 Image: Give Peace a Voice @Greg Spalenka for the Peace Alliance.